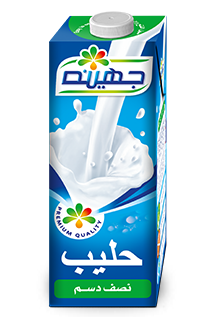 Since its founding as a dairy company in 1983, Juhayna has inspired consumer confidence with the excellence of its milk products. 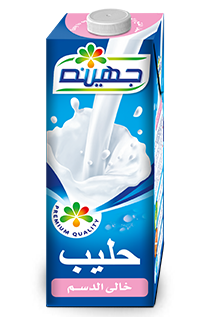 Having worked diligently to encourage a national transition from loose milk consumption to packaged milk in order to deter the health risks of the former, Juhayna milk in all its varieties has become a trusted household name. 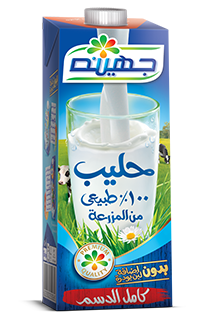 Sourced from Egypt’s highest quality dairy farms, Juhayna milk is sold under 5 distinct brands that include top-selling full cream, half cream and skimmed milk as well as flavored milk products that successfully cater to a large and diversified consumer base. With a high concentration of calcium (230 g / 200 g), vitamins, and fats (6 g /200 g). Our full cream milk is available in 200 ml, 1/2 liter, 1 liter, and 1.5 liter packaging. Our half cream milk combines the great taste of fresh milk with lower levels of fat (3 g / 200 gm). Infused with a high concentration of calcium and other vitamins, it provides the ideal alternative for our consumers who are in search for a lighter choice of milk. Our half cream milk is available in 1 Liter packaging only. With only 0.5 g/ 200 gm of fat, our skimmed milk is the ideal choice for our weight conscious consumers looking to maintain a healthy life-style. Our skimmed milk is available in 200 ml, 1/2 liter, 1 liter, and 1.5 liter packaging. Our foam milk provides a memorable taste infused with a rich supply of vitamins. It is produced from UHT Cow Milk, especially made for foam, and has a 3% fat concentration. It should be stored in a dry area no more than 30 degrees celsius. It is available in 1.5 liter packaging only.